I was looking for something different to go with grilled salmon when I stumbled upon this recipe for white bean salad. It combines fresh green beans with tomatoes and olives drizzled with a tangy vinaigrette. This white bean salad makes for a great side dish at any picnic or BBQ. Add canned tuna for a tasty lunch to take to work or use the dressing to flavor your favorite steamed vegetables. Steam green beans by dropping them into a pot of salted boiling water. Blanch for 3-5 minutes. Drain water then cover pot. Meanwhile, make dressing: Whisk oil, vinegar, mustard, salt and pepper until well blended. Cut green beans into smaller bite sized pieces. 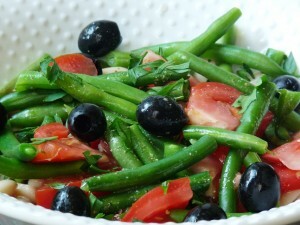 In a large serving bowl, gently toss green beans, cannellini beans, tomato and olives. Drizzle dressing over salad and garnish with parsley, if desired. – 2 cans (5 to 6 oz each) solid light tuna in olive oil, undrained. Replace the oil in the can for 1/4 cup olive oil. – Use 1 (12 oz) bag microwavable green beans in the place of fresh green beans. – Go Mediterranean by mixing 8 oz green bean with two bags mixed greens, 2 cucumbers seeded and sliced, grape tomatoes in the place of wedges, 1 can (12 oz) tuna in oil drained, olives, 1/2 cup Greek salad dressing, 1/2 cup crumbled basil-tomato feta cheese.